Review by AllTheBestFights.com: 2018-11-03, amazing mexican war in which both boxers showed big heart and granite chin: this is the action we want for a boxing Fight of the Year 2018 candidate, Miguel Berchelt vs Miguel Roman gets five stars! 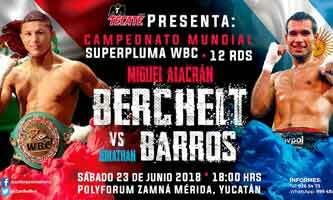 The Wbc super-Fw and former interim Wbo champion Miguel Berchelt entered this fight with a pro record of 34-1-0 (30 KOs=88%) and he is ranked as the No.1 super featherweight in the world. ‘El Alacran’ Berchelt suffered his only loss when he faced Luis Eduardo Florez in 2014, since then he has won 13 consecutive bouts beating Takashi Miura (Miguel Berchelt vs Takashi Miura), Maxwell Awuku (Miguel Berchelt vs Maxwell Awuku) and Jonathan Victor Barros in his last three (Miguel Berchelt vs Jonathan Victor Barros). His opponent, Miguel Roman, has an official boxing record of 60-12-0 (47 KOs=78%) and he entered as the No.4 in the same weight class. Mickey Roman lost to Takashi Miura last year (Roman vs Miura) but then he has won four bouts defeating Aristides Perez (Miguel Roman vs Aristides Perez) and Michel Marcano in 2018 (Miguel Roman vs Michel Marcano). 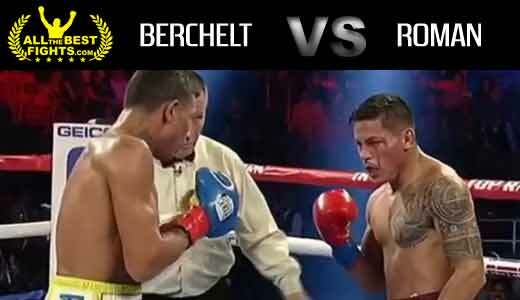 Berchelt vs Roman is valid for the WBC World super featherweight title (Berchelt’s fourth defense). Watch the video and rate this fight! Review by AllTheBestFights.com: 2018-06-23, some good exchanges between Miguel Berchelt and Jonathan Victor Barros but it is not enough to get three stars: it gets two. The Wbc super-Fw and former interim Wbo champion Miguel Berchelt entered this fight with a professional boxing record of 33-1-0 (29 KOs=88%) and he is ranked as the No.1 super featherweight in the world. ‘El Alacran’ Berchelt suffered his only loss when he faced Luis Eduardo Florez in 2014, since then he has won 12 consecutive bouts beating Francisco Vargas (4-stars fight, Vargas vs Berchelt), Takashi Miura (Miguel Berchelt vs Takashi Miura) and Maxwell Awuku in his last three (Miguel Berchelt vs Maxwell Awuku). His opponent, the former Wba Fw champ Jonathan Victor Barros, has an official record of 41-5-1 (22 knockouts) and he entered as the No.18 featherweight but he comes off the loss against Lee Selby (Lee Selby vs Jonathan Victor Barros); before this bout, in 2016, he had beat Satoshi Hosono. Berchelt vs Barros is valid for the WBC World super featherweight title (Berchelt’s third defense). Watch the video and rate this fight! Review by AllTheBestFights.com: 2018-02-10, pretty good fight between Miguel Berchelt and Maxwell Awuku: it gets three stars. The Wbc super-Fw champion Miguel Berchelt entered this fight with a record of 32-1-0 (28 KOs=87%) and he is ranked as the No.2 super featherweight in the world (currently the #1 in this division is Vasyl Lomachenko). ‘El Alacran’ Berchelt suffered his only loss when he faced Luis Eduardo Florez in 2014, since then he has won eleven consecutive bouts beating Piriyapinyo (Berchelt vs Piriyapinyo), Francisco Vargas (4-stars fight, Vargas vs Berchelt) and Takashi Miura in his last three (Miguel Berchelt vs Takashi Miura). His opponent, Maxwell Awuku (who replaces Cristian Mijares), has a boxing record of 44-3-1 (30 knockouts) and he lost to Daud Yordan in 2015, after this bout he has won four bouts defeating Jonathan Yartey in 2017. 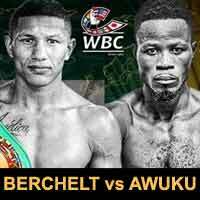 Berchelt vs Awuku is valid for the WBC World super featherweight title (Berchelt’s second defense). Watch the video and rate this fight! Review by AllTheBestFights.com: 2017-07-15, fight not so exciting between Miguel Berchelt and Takashi Miura: it gets two stars. The Wbc super-Fw champion Miguel Berchelt entered this fight with a pro record of 31-1-0 (28 KOs=90%) and he is ranked as the No.2 super featherweight in the world (currently the #1 in this division is Vasyl Lomachenko). ‘El Alacran’ Berchelt suffered his only loss when he faced Luis Eduardo Florez in 2014, since then he has won ten consecutive bouts beating George Jupp (=Berchelt vs Jupp), Chonlatarn Piriyapinyo (=Berchelt vs Piriyapinyo) and Francisco Vargas in his last three (4-stars fight, Vargas vs Berchelt). His opponent, the former Wbc super-Fw champion Takashi Miura, has an official boxing record of 31-3-2 (24 KOs=77%) and he entered as the No.4 in the same weight class. He lost to Francisco Vargas in 2015 (The Ring magazine Fight of the Year 2015, Miura vs Vargas) but then he has beat Jimmy Borbon and Miguel Roman (4-stars fight, Roman vs Miura). Miguel Berchelt vs Takashi Miura is valid for the WBC World super featherweight title (Berchelt’s first defense). Watch the video and rate this fight! Review by AllTheBestFights.com: 2017-01-28, very tough fight with some wild exchanges and a tremendous pace: Francisco Vargas vs Miguel Berchelt is one of the best boxing fights of 2017 and it gets four stars! The undefeated Francisco Vargas entered this fight with a boxing record of 23-0-2 (17 knockouts) and he is ranked as the No.2 super featherweight in the world (currently the #1 in this division is Vasyl Lomachenko). He won the Wbc super-Fw belt in 2015, against Takashi Miura (The Ring magazine Fight of the Year 2015, Miura vs Vargas) but then he drew with Orlando Salido in 2016 (5-stars fight, Vargas vs Salido). His opponent, Miguel Berchelt, has an official record of 30-1-0 (27 KOs=90%) and he entered as the No.15 in the same weight class. He suffered his only loss when he faced Luis Eduardo Florez in 2014, since then he has won nine consecutive bouts beating George Jupp (=Berchelt vs Jupp) and Chonlatarn Piriyapinyo in 2016 (=Berchelt vs Piriyapinyo). ‘El Bandido’ Francisco Vargas vs Miguel Berchelt is valid for the WBC World super featherweight title (Vargas’ second defense). Watch the video and rate this fight! Review by AllTheBestFights.com: 2016-03-12, Miguel Berchelt vs George Jupp gets three stars only thanks to a good finish. Miguel Berchelt entered this fight with a record of 28-1-0 (25 KOs=89%) and he is ranked as the No.19 super featherweight in the world. He suffered his only loss when he faced Luis Eduardo Flores in 2014, after this bout he has won seven consecutive fights. His opponent, George Jupp, has a boxing record of 13-2-0 (4 knockouts) and he entered as the No.86 in the same weight class. He lost to Choi Tseveenpurev in 2011 but since then he has collected nine victories. 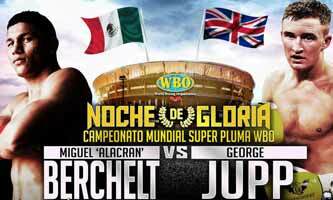 Berchelt vs Jupp is valid for the interim WBO World super featherweight title. Watch the video and rate this fight! Review by AllTheBestFights.com: 2015-06-20, some good exchanges between Miguel Berchelt and Sergio Puente but it is not enough to get three stars: it gets two. Miguel Berchelt entered this fight with a pro boxing record of 25-1-0 (22 KOs=88%) and he is ranked as the No.29 super featherweight in the world while his opponent, Sergio Puente, has a record of 22-1-0 (10 knockouts) and he entered as the No.65 in the same weight class. Both boxers suffered their only loss in 2014: Berchelt was defeated by Luis Eduardo Flores and then has won four consecutive fights beating Rene Gonzalez in his last one (=Berchelt vs Gonzalez) while Puente lost to Fernando Montiel (=Montiel vs Puente) and then he won over Alfredo Rios. 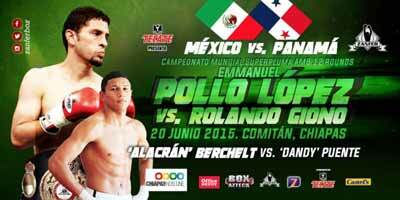 ‘El Alacran’ Berchelt vs Puente is on the undercard of Emanuel Lopez vs Rolando Giono. Watch the video and rate this fight! Review by AllTheBestFights.com: 2015-03-28, pretty good fight between Miguel Berchelt and Rene Gonzalez: it gets three stars. Miguel Berchelt entered this fight with a pro boxing record of 24-1-0 (21 KOs=87%) and he is ranked as the No.30 super featherweight in the world while his opponent, Rene Gonzalez, has a record of 31-7-1 (23 knockouts). Both boxers lost once in 2014: Berchelt was defeated by Luis Eduardo Flores while Gonzalez lost to Evens Pierre. After losing ‘Alacran’ Berchelt has won three consecutive fights beating Antonio Escalante in his last bout (=Berchelt vs Escalante). 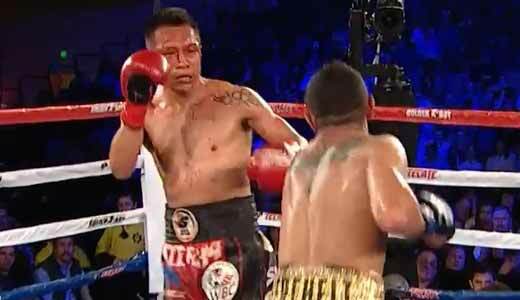 Berchelt vs Gonzalez is valid for the vacant WBO NABO super featherweight title; undercard of Juan Francisco Estrada vs Rommel Asenjo. Watch the video and rate this fight! Review: 2014-10-11, pretty good fight between Miguel Berchelt and Antonio Escalante: it gets three stars. Miguel Berchelt entered this fight with a boxing record of 23-1-0 (20 KOs=87%) and he is ranked as the No.37 super featherweight in the world while his opponent, Antonio Escalante, has an official record of 29-6-0 (20 knockouts). Berchelt’s only loss came in his first bout of 2014 to Luis Eduardo Flores, after that bout he won twice. Berchelt vs Escalante is on the undercard of Jorge Paez Jr vs Aaron Herrera. Watch the video and rate this fight!